Google is testing a number of changes to its search results, including a way for select publishers to enhance their page descriptions, a way for searchers to jump to sub-sections of a web page and automatically correcting misspelled queries, to some degree. In the screenshot, you can see how after the page description for this restaurant review on Citysearch, there’s a separate line that allows for a price range to be shown, the number of reviews from Citysearch members and the overall “star” rating of the restaurant. See how the sections in bold correspond to the actual description shown (summary), the price range (pricerange), the number of reviews (ratingcount) and average rating (ratingstars). Any page from one of five test sites using these and other attributes have their descriptions enhanced with the information. These enhanced listings are similar to Yahoo’s Search Monkey product and part of a continuing trend for search listings to show more than the standard title, description and URL of a web page. Should you go out and start marking up your pages now? I wouldn’t bother. Right now, enhanced listings at Google only work for the sites in the test program. It won’t help other sites. In addition, the syntax might change or be supplemented with the ability to use standard Microformats. Supporting Microformats or some way of tagging existing information within a web page would be great. While Yahoo also supports Microformats (and other tagging methods), these still require a developer to go through and create an application that enhances the result. With Google’s system, no developer knowledge would be required. If you know that a price range is on your existing page, and you add a small bit of HTML code that says in someway to Google “this is the price range,” that’s it — your listing will be enhanced automatically (in cases where Google chooses to do it). How can you see these enhanced results when searching? You have to be lucky. Right now, they’re only being shown to a select group of searchers picked randomly from those who visit Google who are also in the US. If the experiment is deemed successful, then everyone might see them in the future. Another experiment that impacts page descriptions also has no official name, so I’ll give it one — Pagelinks. Sitelinks have been out there for ages. Just over a year ago, Google even introduced a way for site owners to control Google Sitelinks to some degree, for their own listings. Notice how there are links after the words “Jump to” right at the beginning of the snippet, embedded in the description? Click on these, and you’ll jump to a place within the page that listed, rather to a completely different page within the site. Get it? Sitelinks jump you to various places within a particular web site. Pagelinks jump to spots within a particular page itself. How do you get these? There’s nothing you can do other than to have pages that contain internal anchor links. Don’t know what those are? Look at this page from Wikipedia, which is one of the screenshots above. Scroll down, and you’ll see the Contents area where if you click on a link, that jumps to other places within the page. That’s an anchor link — it jumps you within a page, rather than out of it. If your page has internal anchors, that makes it eligible to have Pagelinks. Unlike Sitelinks, Pagelinks may show up in descriptions regardless of where a page is listed — Sitelinks only show for pages in the number one spot. And why does a description get a Pagelink and which exact link is selected? Google simply said that it is working on the algorithm that controls all this. Should you go out and start adding internal anchors? I would do this only if it already makes sense to help your users that need to navigate within a particularly long page. Keep in mind that right now, only a sample of Google searches even see Pagelinks. The experiment might be discontinued. If successful, I think it’s likely we’ll see Pagelinks control come along similar to Sitelinks control. So I’d be in watch-and-see mode, for the moment. 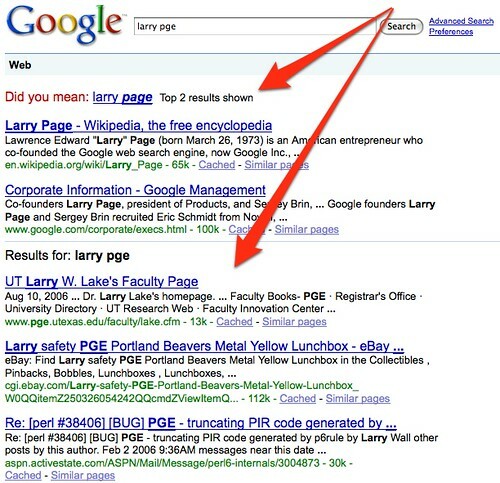 See how the “Did you mean” message comes up followed by the words “Top 2 results shown.” What Google is doing is automatically showing you the first two results for the correct spelling [larry page] and then showing the remaining results for [larry pge]. “This approach gets users to the results they wanted faster. Showing the results of the original query accounts for cases when query correction was undesired,” said Johanna Wright, director of product management at Google. I think it’s a good change. There was a time when some search engines just automatically corrected spelling, which can seem like the right thing to do, but I always found it kind of annoying. This is a good compromise. Unlike the other changes, this isn’t an experiment but instead a permanent change being rolled out. Everyone should see it within the next week or two. In a somewhat related set of experiments, Google’s also testing ads, links and answers within its Google Suggest service. 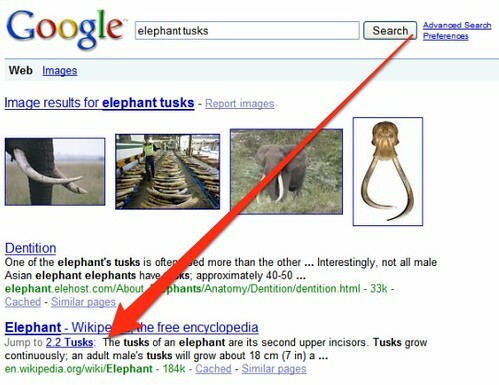 See our separate story, Google Search Suggest Get Ads, Links & Answers, for more about that.